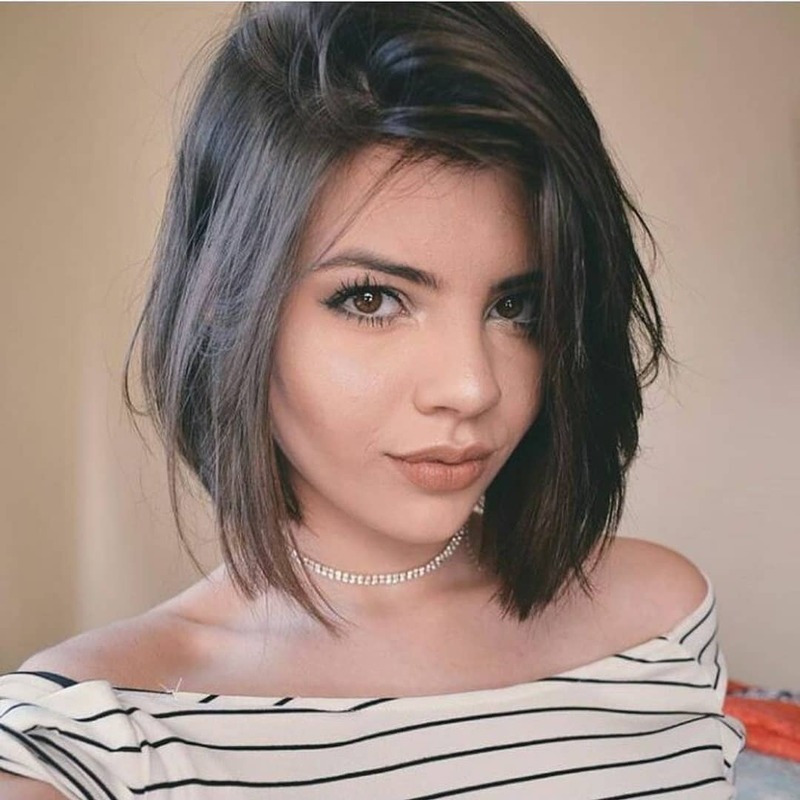 Today’s exciting gallery of flattering shoulder-length haircut ideas is not dominated by blonde hairstyles for once! 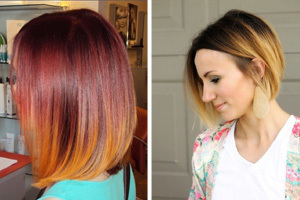 Red, orange and auburn in vibrant high-pigment colors are dominating this year’s trendy, new hairstyles. 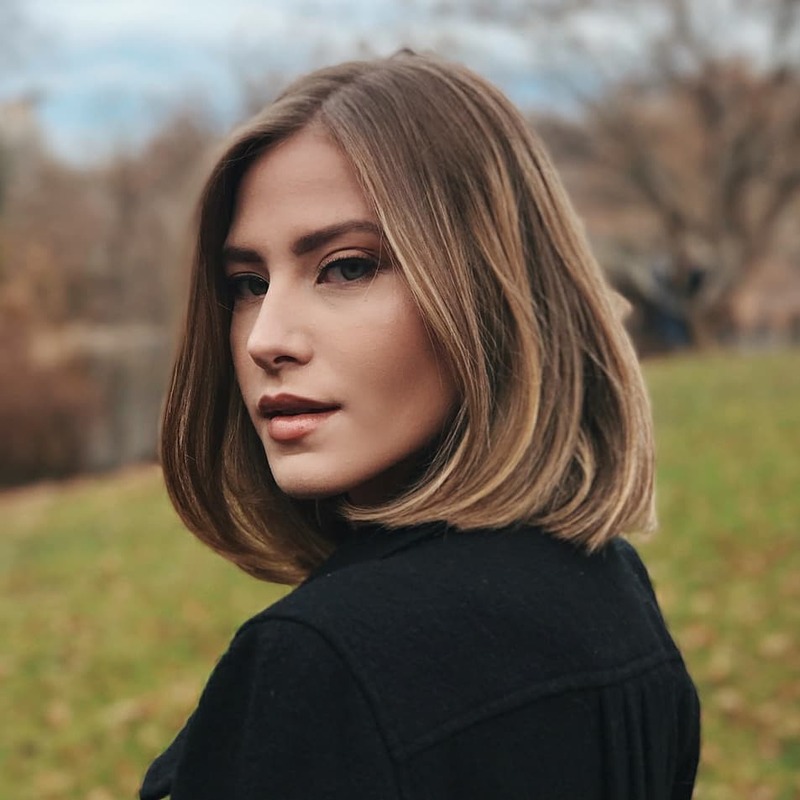 But, of course, we also have shoulder length hairstyles in blonde, brunette and beautifully-soft, charcoal black – to keep us all looking our absolute best! 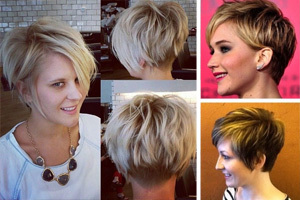 Want a classy, easy-care haircut that also attracts positive attention? Well . . . here it is – in a very stylish long angled bob hairstyle tinted a fabulous russet-red shade! 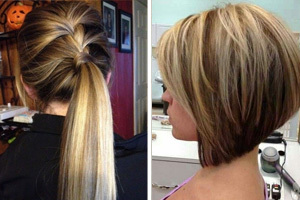 This shoulder length haircut is a fantastic long to medium makeover hairstyle. It’s shown here with a center part to suit oval faces. But you can adjust the parting to suit your face, or add an up-to-the-minute straight-across fringe. This model’s dark-coffee hair color needed just a little extra ‘something’ to accentuate the silky texture and casual movement. So the colorist added subtle medium ash-brown balayage next to the face and in fine vertical highlights around the head. This helps an all-over color on fine or medium hair to reflect more light and look thicker. The hair is cut to graduate down gently from the shorter back. An asymmetric vibe is added by the side parting and hair styled in a right-angle shape framing the forehead helps balance round faces. This is a great retro-hairstyle from the ever-popular 1960’s haircuts. In particular, it shows disconnected layers on either side of the chin, styled into high-fashion ‘hooks’. The short, straight-across fringe completes a flattering hair frame, accentuating lovely brows and blue eyes. The cut suits medium and thick hair types and hair is left in long layers, with concave shaping at the tips. Concave texture makes hair fall naturally into a curved-under shape after washing, making this a trendy, easy-care choice. 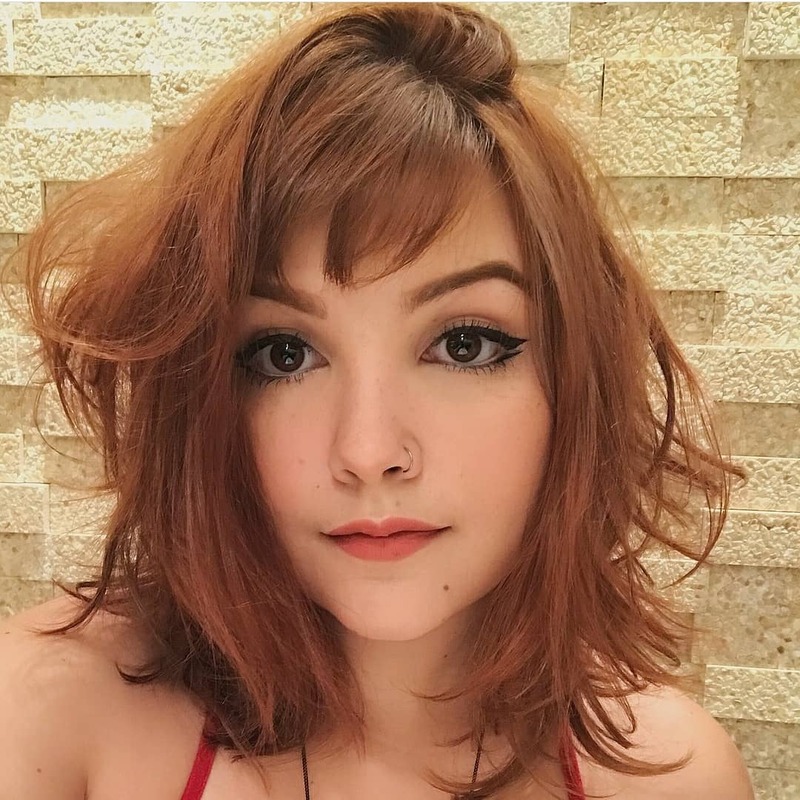 This lovely beige and brown hair color design is perfect for switching dark-blonde/mousey-brown hair to a trendy, flattering look! Mother Nature does make mistakes. So if you like to look natural, but have a dull, natural hair color – this classy beige-blonde balayage is a great option! The off-centre parting divides in a way that ‘cuts-off’ square corners on the forehead, making the top of the face symmetrical with the lower half. This trendy, easy-care haircut is perfect for ‘outdoor girls’. To go this light, you should already have naturally fair hair. Otherwise you risk ruining the condition of your hair altogether. As this model has pale skin, with warm undertones, the shade is softened with beige to get a skin flattering color. True ash-blonde doesn’t suit skin with warm undertones, but this color design gets the ‘ash’ vibe by tinting the roots gentle, light gray. This cute, tousled bob is lightly with textured tips flipped-out to create volume, in a trendy style that adds ‘body’ to fine hair. Here’s a chic long bob for thick hair to keep you looking casually, well-groomed on any occasion. The color is a soft, charcoal-black shade suitable for skin with cool undertones. 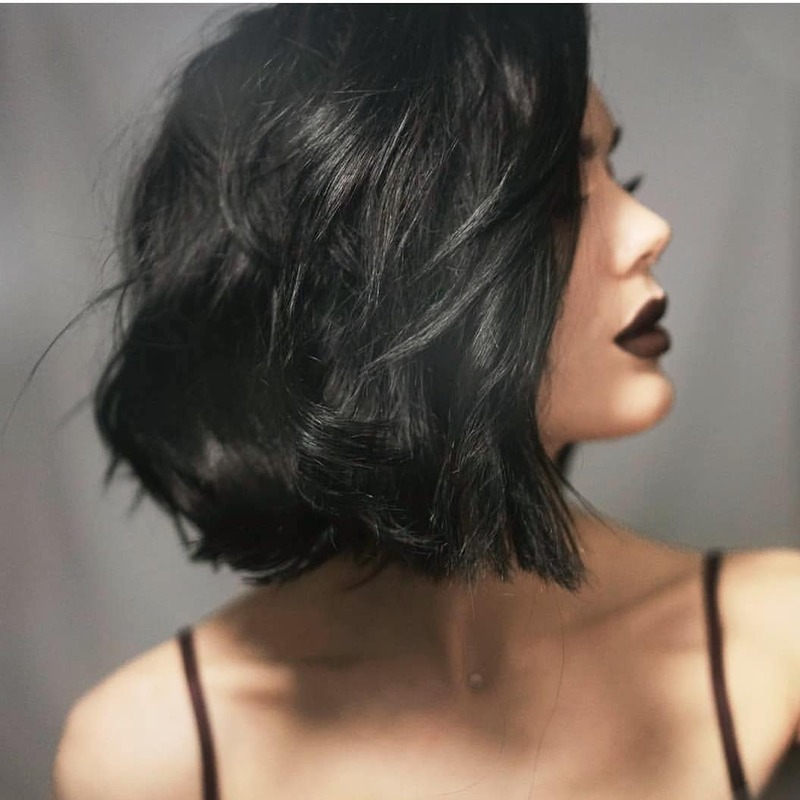 And you can see how lovely the model’s pale complexion looks with this natural, black color and rouge-noir (red-black) lipstick for extra dramatic effect! The hair’s cut to just past the chin, with long layers and lightly textured tips. Overall, this classic long bob looks very feminine with tousled texture and soft wavy movement. 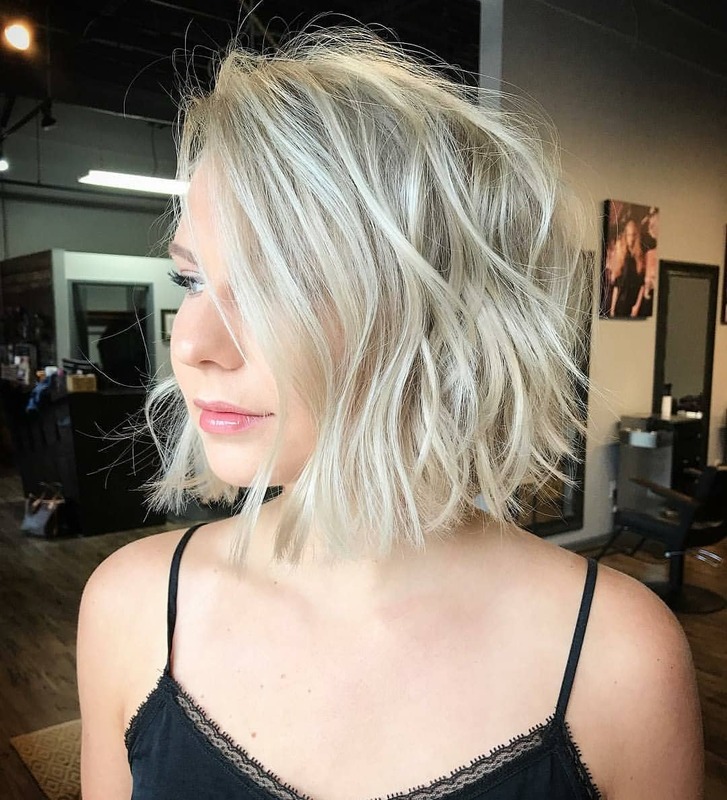 Doesn’t this gorgeous blonde casual bob make you long for a sunshine holiday! 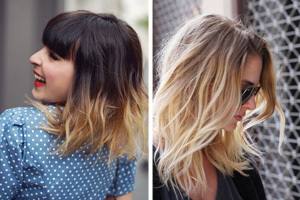 And that’s no surprise as the neutral-blonde color is highlighted with white-blonde balayage for a beach-lover look. These flat, loose waves are more elegant than ‘beachy-waves’ and the center part highlights the model’s oval face shape. Notice how the waves draw attention to the eyes and red lips in a flattering way. And with dove-gray roots, the effect is soft and appealing. For anyone with dark-blonde or mousey-brown hair, this could be the color makeover you’ll never want to change! 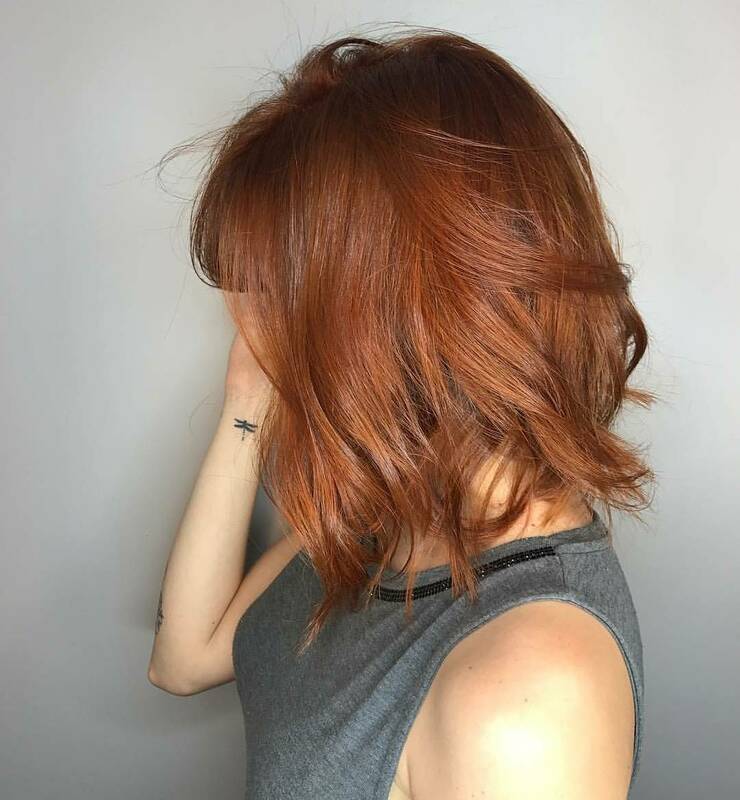 The shade is a very natural medium auburn, with orange tones to flatter skin with a warm undertone. And the effect is fabulous on this face-framing long bob hairstyle which accentuates those large, brown eyes perfectly! 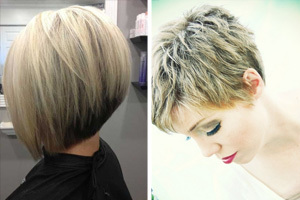 You can add lots of volume and movement on an angled bob with trendy, flipped-out sides. 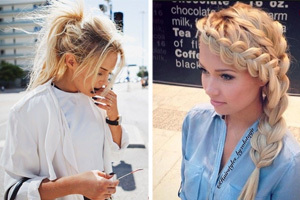 Styled casually over the head adds volume on top and that cute piece-y fringe also shows off the eyes and brows. 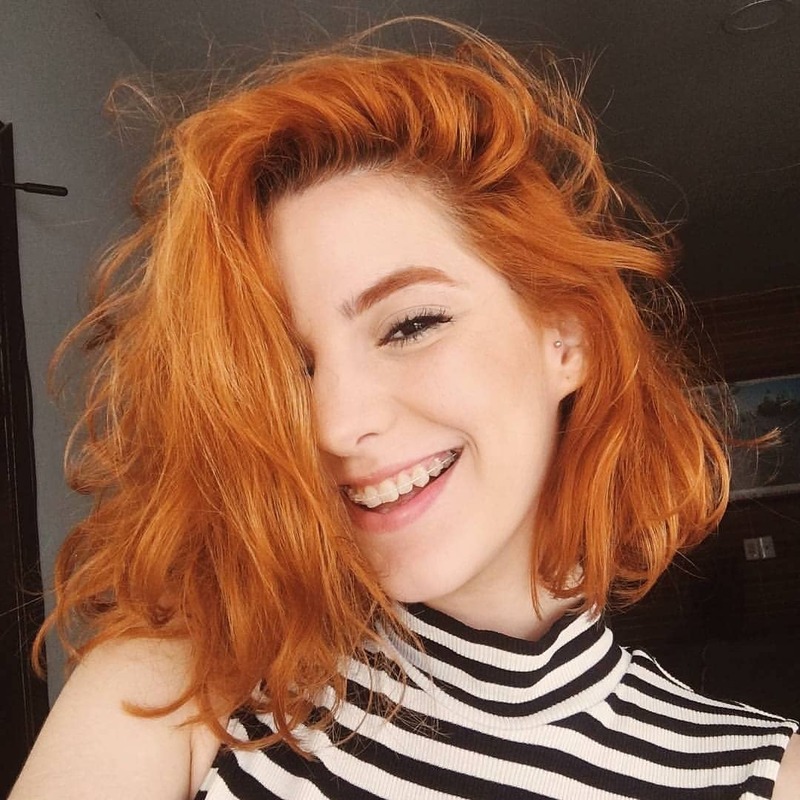 Here’s a young woman who’s delighted with her new shoulder length haircut and color! And that’s because this haircut has been tailor-made to flatter her pale skin-tone with warm undertones. 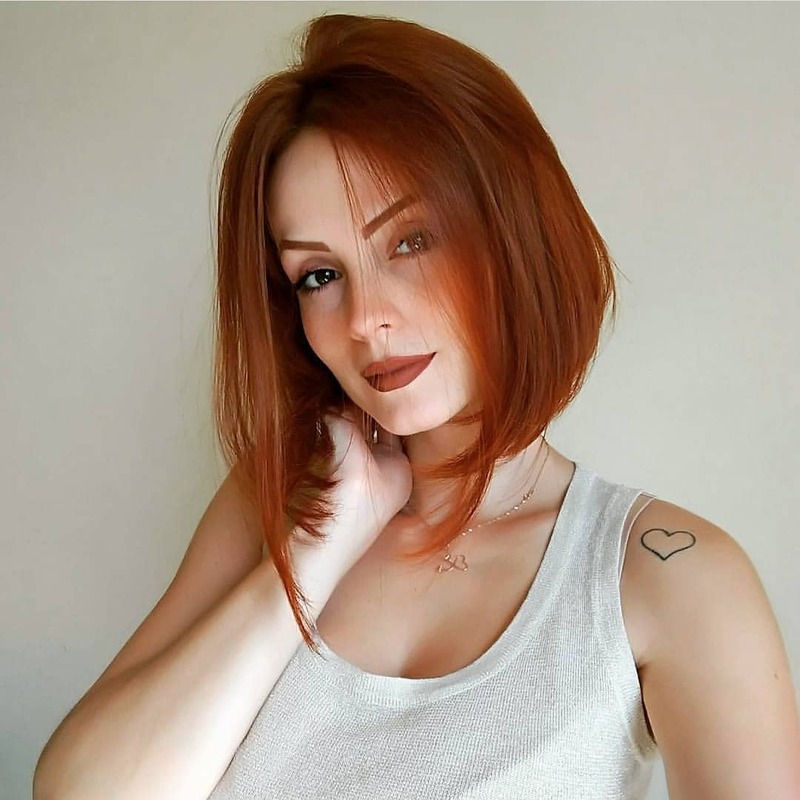 Is she a natural red-head? It’s impossible to tell as the rich all-over shade, highlighted with lighter orange balayage, looks completely natural. The look is lively and carefree, on hair cut in long layers with lightly textured tips. The swept-over front section drapes nicely over one side in a flirty, peek-a-boo look and tousled finish adds density to fine hair! This darker version of stylish burnt-orange is another rich shade that also looks very natural on the model above. 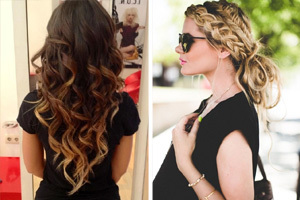 So if you like to look attractive in a more natural way than say, ash-blonde or brown shades, try this trendy tone! The long angled bob is a great way to have ‘long’ hair, if your hair is medium or fine. Long layers retain the density of fine hair types and a windswept finish creates extra volume without curls. With a straight across fringe, this is a lovely face-framing style for complexions with neutral, or warm undertones.